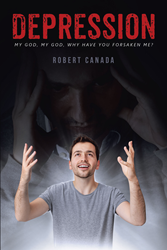 “DEPRESSION: My God, My God, Why Have You Forsaken Me?” from Christian Faith Publishing author Robert Canada is a conversation about depression among Christians. Faith in Christ is supposed to inoculate Christians from the darkness of depression and suicide, but the truth is Christians still suffer from these diseases and need the support of their fellow Christians. “DEPRESSION: My God, My God, Why Have You Forsaken Me?”: a much needed and frank discussion on the darkness plaguing Christians everywhere. “DEPRESSION: My God, My God, Why Have You Forsaken Me?” is the creation of published author, Robert Canada. Bob has been involved in ministry for over twenty years as a Youth Pastor, Associate Pastor, and Senior Pastor. He began his secular career in the offshore oil industry in 1977 before accepting Christ as his Savior in 1986. He began his ministry in 1989 by teaching adult discipleship classes. He later took over as Mission’s Director for his local church. In 1996, he accepted the position as Youth Pastor, later stepping into his first position as Associate Pastor. Today, he continues his work in the ministry and offshore oil industry. His job has taken him to Africa, Europe, Middle East, and South America, which has given him the opportunity to share Christ with those from other nations and walks of faith. Published by Christian Faith Publishing, Robert Canada’s new book shares that the National Institute of Mental Health estimates sixteen million adults in the United States suffer from some form of depression. The World Health Organization estimates 350 million people in the world suffer from depression. Over thirty thousand suicides take place in America each year with depression a contributing factor in sixty percent of those causes. The suicide epidemic has become the fourth leading cause of death among adults ages eighteen to sixty-five. Unfortunately, this topic is overlooked at the pulpit far too often. There are millions of Christians within the 350 million suffering from depression. These brothers and sisters in Christ are suffering from something they cannot control. They wake each morning to another day of dread, crying out to God for relief with none in sight. They are lost in a dark, never ending tunnel. These faithful are alone in their fight to drive this beast out of their lives. There are millions fighting this battle each day who are searching for the light at the end of the tunnel. The time has come to talk about depression in Christianity. View a synopsis of “DEPRESSION: My God, My God, Why Have You Forsaken Me?” on YouTube. Consumers can purchase “DEPRESSION: My God, My God, Why Have You Forsaken Me?” at traditional brick & mortar bookstores, or online at Amazon.com, Apple iTunes store, or Barnes and Noble. For additional information or inquiries about “DEPRESSION: My God, My God, Why Have You Forsaken Me?”, contact the Christian Faith Publishing media department at 866-554-0919.